This has been picked up by the mainstream media for obvious reasons: they are blaming the Trump tariffs for their closure. The only tariff that really significantly affected CaseLabs is that on aluminum. Which only went in place in March 2018. While tariffs certainly are NOT a good thing for the economy, it’s a stretch to blame them for bringing down CaseLabs. The “default of a large account” is the part few pay attention to. 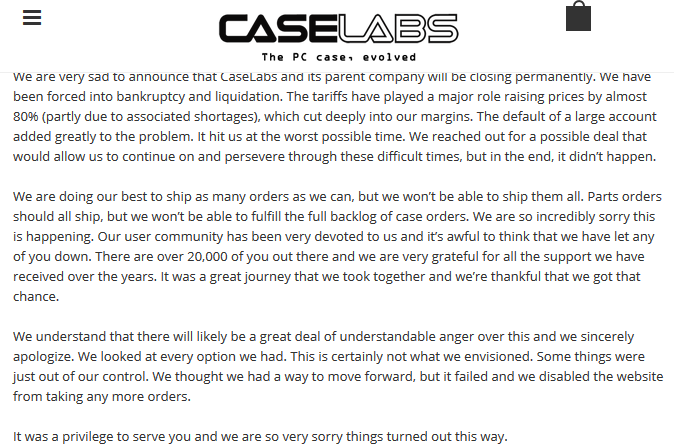 And for CaseLabs to blame the tariffs for their woes is beyond the pale, since they’re looking to shift the blame for their closure to the White House and away from their business practices. And many have taken the bait. They were already insolvent. The tariffs only sealed their fate. For the tariffs to cause their closure in the equivalent of one fiscal quarter means they were already in the red. Deep in the red. The large account going into default robbed them of the revenue they needed to keep going. To be “forced” into liquidation – Chapter 7 bankruptcy – means they and their creditors do not foresee CaseLabs (and their parent company) ever having the revenue to recover their losses and pay on their liabilities. Which were already mounting and already getting them in trouble with their creditors (likely long) before the tariffs were enacted. Even without the tariffs, that large account going into default likely would’ve taken them under anyway, especially if it was a customer who went into bankruptcy. Probably not in August 2018, but they likely would not have survived the year – or barely made it into 2019 – without additional revenue or funding to make up the shortfall. CaseLabs made great computer chassis, with a massive amount of customization options. But it is not proper to lay even the majority of blame on the tariffs. They were already in trouble before the tariffs were enacted. Being forced into Chapter 7 liquidation, bypassing Chapter 11 reorganization, shows this. That they weren’t able to work out a deal with their creditors also shows this. But everyone wants to blame the tariffs because that’s convenient and… Trump enacted them.